Rangers Sgt. Darrell Hannah and Chief Brady Smith are the current leadership team for the ranger division. John Humston and Ed Bice share a memory at the 40-year anniversary dinner. Photos courtesy of GCP&T Former GCP&T Director Ed Dressler laughs with John Humston, one of the first part-time GCP&T Rangers who also served as naturalist. The three first GCP&T Rangers — Ed Bice, Rick Bull and John Humston — take their seats of honor in front of the current GCP&T Rangers, Senior Ranger Charles Frazier, Jason Gantt, Sgt. Darrell Hannah, Chief Brady Smith, Richard Vincent, Tim Fouts and Lance Geldbaugh. 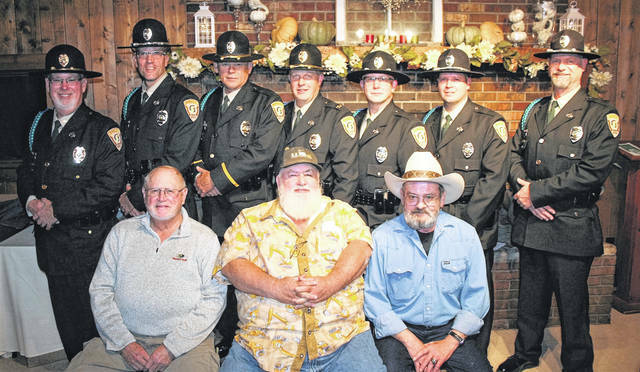 XENIA — Rangers from the past 40 years gathered together Nov. 9 at The Lodge at Clifton Reserve to celebrate the 40th anniversary of the law enforcement agency created in 1979 under the leadership of former GCP&T Director Charles “Ed” Dressler. GCP&T Chief Ranger Brady Smith said it was as if no time had passed for the former colleagues. The unit was formed in 1979 with three rangers that already served with the park agency in the maintenance, programming and naturalist divisions. After a combined total of 30 days of training, GCP&T Operations Supervisor Ed Bice, GCP&T Maintenance Supervisor Rick Bull and GCP&T Naturalist John Humston were commissioned as rangers in 1979. With only a few of the past rangers not able to attend, the group enjoyed dinner, commemorative awards and the sharing of stories. Greene County Park Board Commissioners John Finlay, Tony Sculimbrene and Michelle Jenkins also attended. https://www.beavercreeknewscurrent.com/wp-content/uploads/sites/49/2018/11/web1_darrell_Brady2.jpgRangers Sgt. 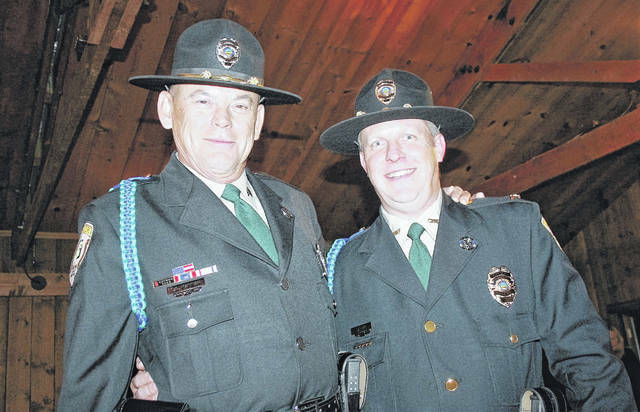 Darrell Hannah and Chief Brady Smith are the current leadership team for the ranger division. 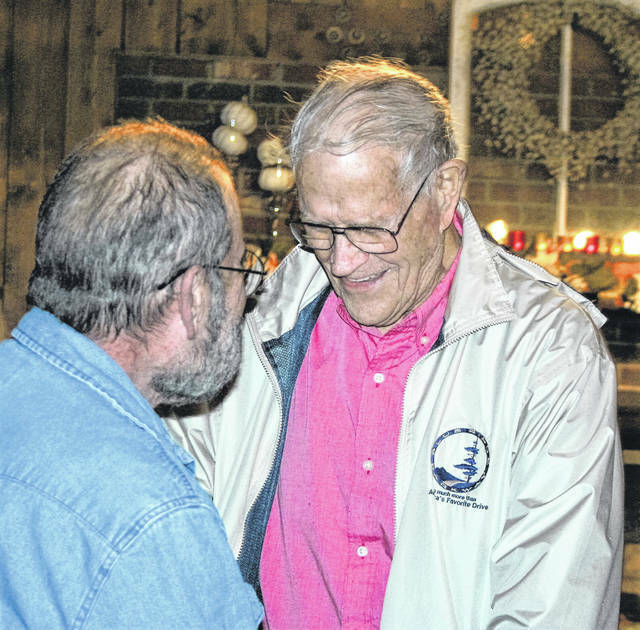 https://www.beavercreeknewscurrent.com/wp-content/uploads/sites/49/2018/11/web1_Dinner.jpgJohn Humston and Ed Bice share a memory at the 40-year anniversary dinner. 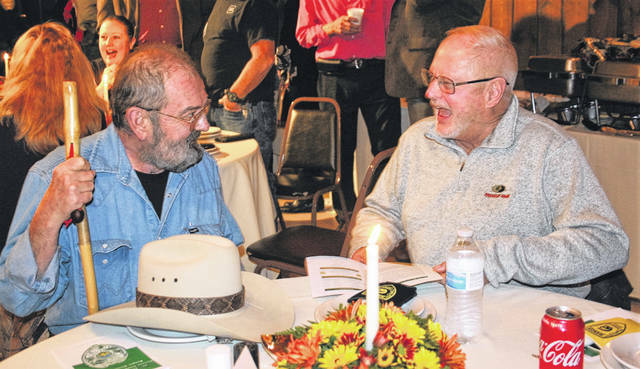 https://www.beavercreeknewscurrent.com/wp-content/uploads/sites/49/2018/11/web1_Dressler.jpgPhotos courtesy of GCP&T Former GCP&T Director Ed Dressler laughs with John Humston, one of the first part-time GCP&T Rangers who also served as naturalist. https://www.beavercreeknewscurrent.com/wp-content/uploads/sites/49/2018/11/web1_Rangers_and_originals.jpgThe three first GCP&T Rangers — Ed Bice, Rick Bull and John Humston — take their seats of honor in front of the current GCP&T Rangers, Senior Ranger Charles Frazier, Jason Gantt, Sgt. Darrell Hannah, Chief Brady Smith, Richard Vincent, Tim Fouts and Lance Geldbaugh.